This grown-up lunch box includes utensils, salad dressing tube, and a reusable ice pack. Bye-bye, brown bag. With this grown-up lunch box, your healthy, homemade meal travels in style. The BPA-free plastic container has dividers to keep food compartmentalized, a built-in vent for microwaving hot foods, and a reusable ice pack for chilling your perishables. 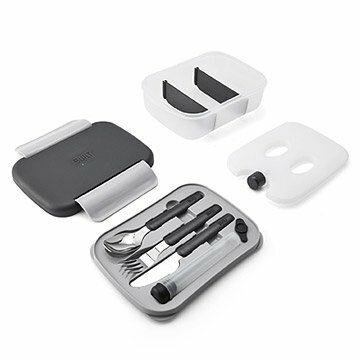 There is even a set of portable-sized, stainless steel flatware and a tube for toting salad dressing. Made in China. Click here for the components included in your Ultimate To-Go Container. Please see below for measurements. All components, except the ice pack, are dishwasher safe. Remove utensils and ice pack prior to microwaving. I've used this lunchbox every day since I've gotten it. My boyfriend has demanded one for himself because he likes it so much. It was everything I wanted and more. This was a gift to myself because I wanted a one-stop lunchbox kit with a flexible layout, reasonable dimensions, and all the necessary add ons! Great for having everything you need for packing different lunches. The locking latch on one side was sent with a short hinge nib and may not last long. That's why it gets 4/5 stars as it otherwise is well thought out and constructed. I picked this out because it looked like a bento my friend could easily carry in her backpack. Others I had seen didn't offer a solution for storing sauces or dressings, utensils, or ice packs. This one did. When it arrived I regretted not getting one for myself. Very well designed and seemingly well made. I'm trying to be frugal, and hope to use it to more often bring food along as opposed to having to buy it. I bought this for my mom's Christmas present a year ago, and she still absolutely loves it. It's held up really well, she has it in the dishwasher one or two times a week and there's no wear visible on it at all. The only thing she's had a hard time with is keeping track of the ice pack it came with, it's gone missing and it's small enough that if it's still in the freezer, it's completely hidden. I wish I could buy a replacement for it, but she's making do with just keeping it in an insulated bag with an ice pack on the outside. It works very well for her purposes, and she loves being able to bring just one dish to hold all the different parts of her lunch. Perfect for carrying lunch to work or to take on a hike. This is so compact and perfect for carrying a variety of foods in one container. It has everything needed to pack a lunch or snack. I would certainly recommend it. Great for packing a salad for lunch. Keeps your salad greens in place and separate from dressings. Keeps everything cool.